It was a delight to be welcomed back at Laura’s bar/alimentari in our local village of Fiano. I had only been absent for four days, however, this did not stop the chorus of ‘bentornato’ from our favourite locals. This makes me feel rather special, particularly as my man and I are English, if long term, interlopers in a small rural community in Tuscany. You will be aware that I had returned from The London Author Fair, where I had attended seminars and workshops with a view to obtaining some new ideas for marketing by current novel, ‘My Father, The Assassin.’ I now have a lot of following up to do to maximise the benefits. Whilst there, I bumped into another author called James Minter. We were both really surprised, as I was in the middle of reading his three very funny books, The ‘Hole Trilogy’ and he was reading mine! 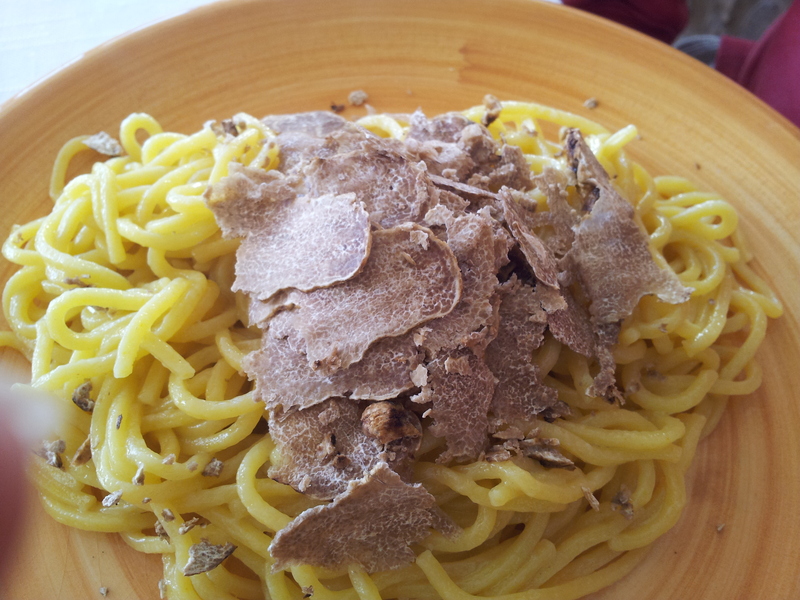 Taglierino del Tartufo (white truffles) still on the menu! However, I was so pleased to be back in our little bit of Chianti last Sunday, in time for lunch at ‘C’era una Volta,’ one of our local ristorante. Whilst there, two Bavarian friends walked in having seen our car outside, so we were able to catch up and have a great lunch together. We parted company with an invite to theirs for supper. They own a beautiful villa next to our old house, which has been bought by Australians! We are very cosmopolitan lot in this area. My man had been busy whilst I was away. Grass cutting and generally tidying up in the garden. The temperature is up to 17 degrees centigrade today, so fingers crossed for lunch in the garden, as it smells so wonderfully spring like now. 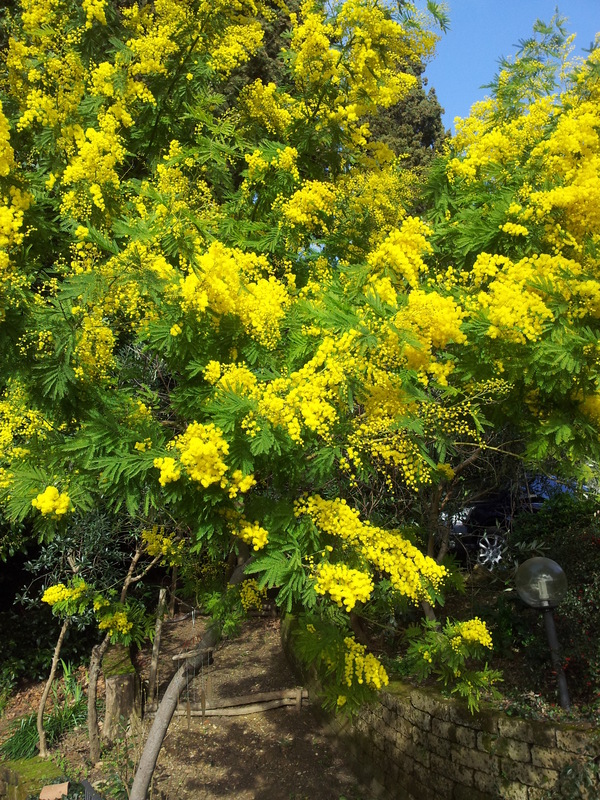 Tomorrow, Saturday, is Festa della Donna (Festival of Women) when mimosa flowers are presented to all female family and friends. Sadly, the mimosa has blossomed too early this year, so the blooms are a little past their best. Nevertheless, we will cut what we can and take some over to Laura at the bar in the morning. So, what has the gorgeous, if aging, Silvio Berlusconi been up to over the last couple of weeks? Rumour has it, that he is thinking of selling his beloved football club AC Milan! This has been denied, however, the team’s performance has been lacklustre of late, and they could lose as much as 51.4 million euros in revenue, if they do not finish in the top four this season! The Team is currently the eight richest team in the world. Last year SB’s personal wealth only increased by 1.5 billion dollars, poor thing, so he perhaps needs a little more in the bank. Mind you, quote John McDuling of Quarz News, ‘Would you buy a used soccer club from Silvio Berlusconi?’ Now that’s a bit harsh…..
Well, enough of that. Must go and think about lunch. I spend a lot of time thinking about it; I just wish someone else would cook it! But the sun is shining, hurrah!